Have you been thinking about searching for legal transcription jobs online? Did you once work as a legal administrative assistant, legal assistant or paralegal? Would you like to find a way to work from home doing legal transcription? Well, then this article may be of interest to you. One of the most popular ways to make money working from home is as a transcriptionist. Two work at home transcription challenges are deciding which type of transcription to pursue and how to gain experience. What Are The Four Types of Transcription and How Do They Differ? I will briefly go over then four types and then focus on legal transcription. General transcription refers to general correspondence such as letters, memos, and meetings from businesses such as banks, financial institutions, schools, and utility companies. The sky is the limit. Legal transcription refers to transcription that would be used in law offices or courtrooms. Most of the terminology is in Latin. Medical transcription would be transcription for doctor's offices, hospitals or clinical settings. These terms can also be Latin, but not necessarily as they refer to human anatomy, modalities, medications, and procedures. Technical transcription refers to transcription for computers and other high tech specialties to compile text books and instructions. What is Particularly Appealing About Legal Transcription Jobs? Legal transcription is for those who have an interest in law or have maybe served in the past in the legal field. Sometimes a legal transcriptionist is called a scopist even though they are NOT the same thing. A scopist is the one who receives the transcription—usually from a court reporter—and becomes the editor and proofreader. The role of a scopist is getting the document to as close to perfect as possible. How Can Someone Get into Legal Transcription? There are certainly courses out there as well as companies considering beginners. Also, if you have a legal background and type fast enough to make it worth your time, then you can also try to venture out into an already established company (see below) or “hang your own freelance shingle” on Guru, Freelancer, Upwork or Amazon Mechanical Turk. What Are 5 Companies Occasionally Offering Legal Transcription Jobs? This company has experienced a lot of growth over the last few years, and this growth has created a sustained workflow for the company's transcribers. Transcriptionists are paid weekly via direct deposit, and they claim to have high pay rates. You will need to be a US citizen to qualify for their transcription positions. For those of you who are experienced and would like more of a challenge when it comes to legal transcription, Cambridge Transcriptionists might be a good fit for you. You are invited to send your cover letter, resume, and transcription examples to their recruiters. From there you can take the necessary steps towards becoming a part-time employee either online or offline. This company is for full- or part-time transcribers in the legal, medical or general transcribing genres. They only hire US residents and income will vary by client and experience even though they will take a chance on less experienced transcribers. For this company, you must have legal or insurance experience to apply. The money will vary based on experience and quality of work. This work-from-home transcribing company only hires US workers to fulfill the role of independent contractor. The pay is twice a month. This company is for both general and legal transcription, and they do accept beginners! The pay is ½ cents a word, and pay will depend upon how fast you can type. Once you sign up using the application form, download the style guide to study for the test. Pay for beginners ranges from $6 to $9 an actual hour. They pay via PayPal every two weeks. This company was founded in 1991 in France as a way to meet the medical, general, and legal transcription needs of the industries. Transcribers make between $15 to $25 an actual hour, and they are open to beginning transcribers. You must take a test to qualify, and sometimes the work is not very steady. It appears that they pay via PayPal once a month. In addition to transcribers, eScribers also needs remote proofreaders. There is a steady flow of work available for proofreaders as well. Keep in mind every company you may apply with has different requirements. Their style guides may vary as well as the equipment needed. Related: What Equipment Does a Transcriber Need? Want to Learn More About Legal Transcription? 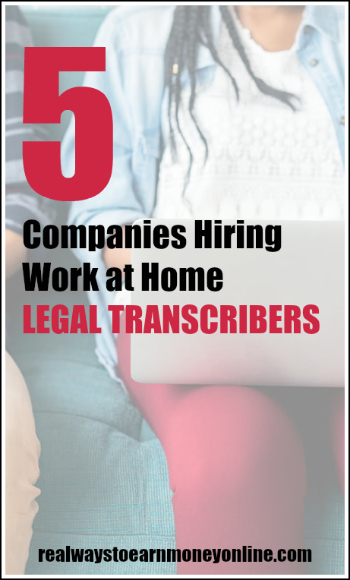 Whether you are a beginning transcriptionist or an experienced one, legal transcription jobs are out there for those who want to work from home. But knowledge is power, and the more you know about legal transcription, the more likely you are to land a job. Transcribe Anywhere, a reputable company offering transcription training, has a FREE 4-day legal transcription mini-course you can take that provides valuable information on legal transcription. The course provides more detail on what legal transcription is, who uses them, the demand for legal transcribers, and of course how much you might earn. It may help you decide if this industry is a fit for you before you go further. Passing this along! Have a great week. Thanks, Cori and congratulations on your blog. Hi Leisa, I have been in the transcription industry for more than 8 years and checked out your resources. These are really few of the most reputed companies in transcription. Compiling all at one place to help job seekers and various work at home moms is really a cool idea. I am going to pass it along my social channels.